Zipato's Zipabox looks promising. It uses an MIT Scratch approach to rules creation that my kids know how to use. As of version 0.9, the product is in alpha state with potemkin features, silent failures and dysfunctional operations. It had no Amazon Reviews when I purchased it in November 2014 and was price at about $300. I noticed some red flags when researching the product on the Zipato support forum, especially this comment from employee Sebastian Popovic in response to a user's question. This Zipato employee wrote, "I really don't understand are you missing something here, or you are just unreasonably supporting our competitors on our support page?". I had the same question as the user and just wanted an answer. There was no need for Soviet-style paranoia and accusations; just answer the question. This is the bad smell produced by a dysfunctional company. The Zipabox depends on Zipato's servers for all access. You log into the box using http://my.zipato.com, not a local IP address from your lan. This "cloud" approach to local device management is unnecessarily cumbersome and insecure. But, I want to control devices in my home through software, so I will learn to live with this, I said. Despite the early warnings and dependency on Zipato's "cloud" services, I purchased the product and began the process to migrate z-wave devices from Vera Lite. 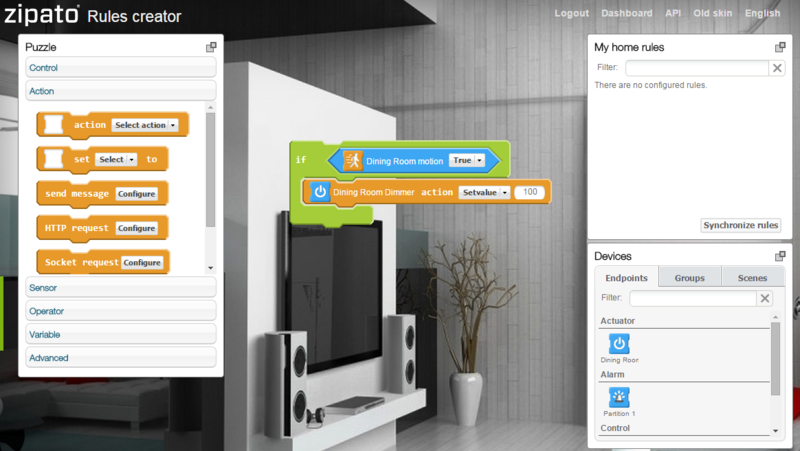 The Zipabox has buttons for "self inclusion", which means becoming a secondary controller in the z-wave network. Unfortunately, these buttons are just for show. According to another employee Marko Katic these options will be operational later.. That was over 1 year ago. As of November 2014, these buttons just show a spinner. Nothing actually happens. Fine. I resolved to manually remove each device from Vera and add them to Zipabox. 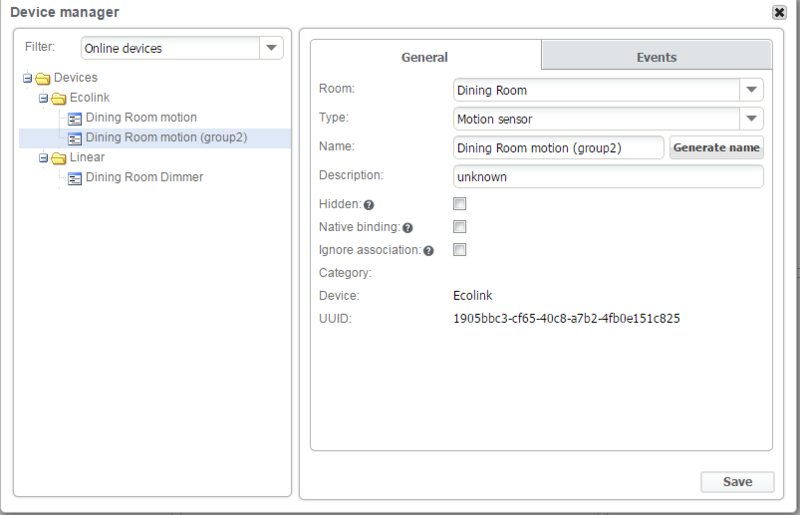 Luckily, I decided to first try it with the Ecolink Z-Wave PIR Motion Detector and Appliance Module to control a single light. The Ecolink PIR paired with Zipabox but in a weird way. It showed two devices, instead of the expected one. Fine. I'll learn to live with it, I said. I now wanted to create a simple rule to turn on the dining room lamps when someone enters the dining room. Very simple. I could have bound the two devices together but I wanted to use the great Scratch-based "Rules Creator". When I am lucky, the rules creator allows me to save rules. Most of the times, something fails and I can not do so. I don't know what fails. There is no feedback or logging. The failures are silent. Very frustrating, but that is typical with emerging products. I'll learn the work-arounds, I said. As I typically do when faced with a black box, I break the problem into smaller pieces. Maybe turning the dining room lights was too ambitious for me, so I decided to create a rule to just trigger an email. THERE IS NO WAY TO TEST RUN THE RULES! There is no "run" or "test" control on the interface that I can use to debug and test the rules. I confirmed this through their support form. This is an alpha product. It is not in the beta stage yet. From the attitude of the employees on Zipato's support forum, lack of basic features and silent failures, this product feels like something produced in a Soviet-era factory. до свидания Товарищ. I'll test Zipato again when it gets to beta stage.